Winter visitors have settled in. 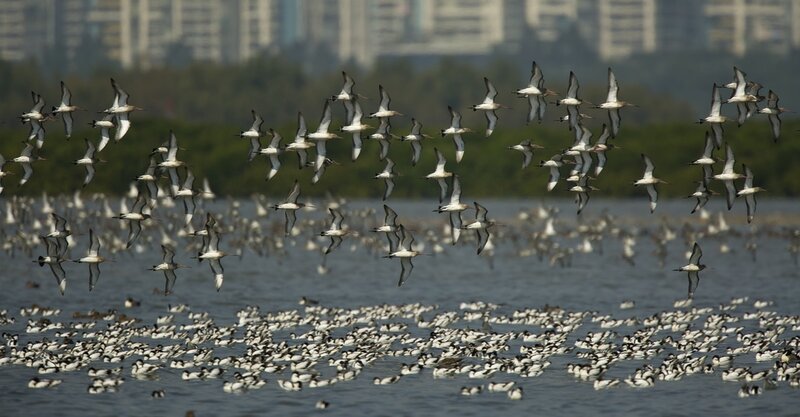 The total number of water birds in Deep Bay usually peaks in this month with up to 60,000 birds of up to 70 different species being counted. In the central New Territories, wintering forest birds are much in evidence, although the number and variety of thrushes and Red-flanked Bluetails vary from year to year. Surges of the winter monsoon may bring in passerines from the north, including several scarce or rare species. Wintering birds are still present in good numbers. There is usually some evidence of movement. The first Barn Swallows arrive to nest. 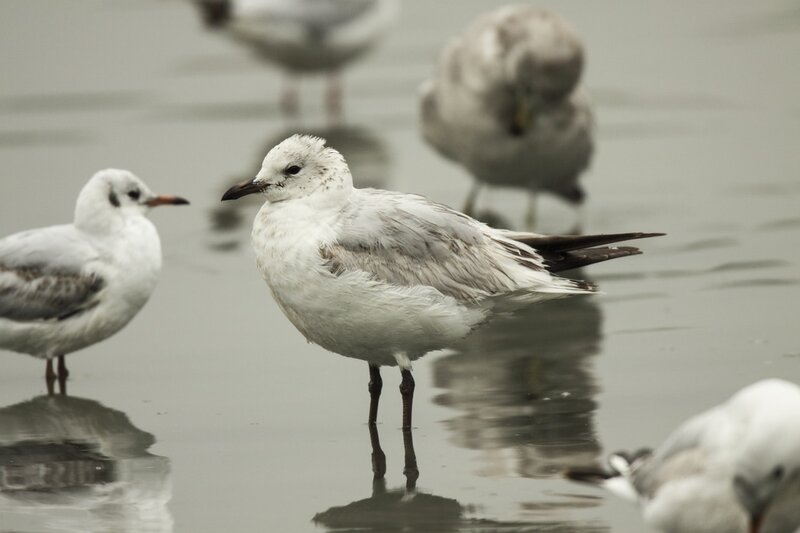 This can be a good month for gulls in Deep Bay, with many of the rare species on the Hong Kong list likely to put in an appearance. A time of transition. The number of wintering birds decreases, and now there is more evidence of passage, particularly towards the end of the month. The variety of waders increases and, as in February, there can be some interesting gulls out in Deep Bay. Grey-faced Buzzards can also occur in good numbers. Needletails may pass through and there may be a movement of Asian House Martins. Passerine migrants can occur at the end of the month, especially on Po Toi. The best month of the year in terms of the number and variety of wader species in the Deep Bay area; over 40 species can be expected, including a number of Eastern Palearctic specialities. It is also a good month for migrating terns. Swinhoe’s Egrets may be present on the Deep Bay mud flats. Passerine migration is variable, but given the right weather conditions, several different flycatchers can be expected along with a variety of swifts, cuckoos, pipits, wagtails, warblers, thrushes and buntings. Scarce and rare birds are often recorded. Po Toi can be particularly productive during this month. Wader passage continues but there is a noticeable decrease in overall numbers as the month progresses. The first part of the month is the main passage period for Whiskered and White-winged Black Terns. Yellow Bitterns will be present on the Mai Po marshes, and other smaller bitterns may occur: Cinnamon, Von Schrenck’s and Black Bitterns, especially during periods of inclement weather. Passerine migration is much less obvious now except for certain species, primarily Arctic Warbler, Grey-streaked Flycatcher and Brown Shrike. The second half of the month tends to be much quieter than the first. Summer is a quiet season for bird watchers. The heat and humidity and general lack of species diversity compared with other seasons wears even the ardent birder down. A handful of immature Black-faced Spoonbills may remain at Mai Po, and a few waders including Nordmann’s Greenshank and Asiatic Dowitcher may linger at the beginning of the month. A small number of waders of several different species may over-summer. A variety of egrets breed in the Mai Po area and elsewhere in the New Teritories. Tai Po Kau holds the usual resident species plus a few summer visitors such as flycatchers and cuckoos. Black-naped, Roseate and Bridled Terns will be breeding on rocky islands off the coast, although these are difficult to access. Another quiet period. There is evidence of return wader passage from mid-month onwards. As with June and July, this month is hot and humid. It is still relatively quiet, but waders on return passage are now more in evidence at Mai Po. Although lacking the variety and numbers of spring, the autumn shorebird migration from mid-July to October does bring with it a good spread of Eastern Palearctic species. From the middle of the month, offshore waters may hold migrating Aleutian Terns. Towards the end of the month, there is a trickle of passerine migrants, most notably Amur Paradise-flycatcher and Eastern Crowned Warbler, moving south through the territory. This month heralds the return of the birding season proper. Woodland-haunting migrants are of particular interest, and birders would hope to see such species as Forest Wagtail, Yellow-rumped and Dark-sided Flycatchers, Siberian Blue Robin and various Phylloscopus warblers. The month is also a good time for seeing Pallas’s Grasshopper Warbler in the territory. Rarer species such as Fairy Pitta, Tiger Shrike and Brown-chested Jungle Flycatcher usually turn up. Movement continues during this month with the arrival of a good variety of water birds, raptors, chats, warblers, flycatchers, starlings, pipits and buntings, usually including a number of rare or scarce species. The final third of the month is perhaps the most productive. Passage continues and a good number of winter birds arrive. This can be an excellent month for buntings, especially around the rice fields at Long Valley. A number of rarities usually turn up. There is a big increase in bird numbers in the Deep Bay area. Migration tails off at the beginning of the month and the regular winter species settle in. In recent years, this month has also proved productive for rarities.